I participated in Operation Baking GALS this month for the Team Maybe for Real, with host Anna of Maybe Just a Little Bit. 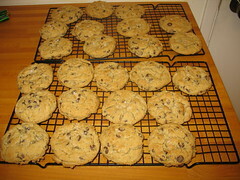 I revisited the NY Times Chocolate Chips that I blogged about a few weeks ago here. They are still quite good, but perhaps not perfect. I think they are growing on me. Especially when they are warm.